Netflix is working with Guillermo del Toro on his long-awaited Pinocchio project. Del Toro is on board to write, direct, and produce the film, which will be a musical stop-motion project and is set to begin production this fall. The Academy Award winning director has talked about making Pinocchio for over a decade, and is happy to finally start working on it. Netflix and del Toro have been working together for the last few years on his Trollhunters animated series as well as an upcoming show entitled Guillermo del Toro Presents 10 After Midnight. Guillermo del Toro's Pinocchio takes place in Italy during the rise of fascism under Mussolini. The project will more than likely be a far cry from Disney's animated classic and a lot different from the live-action version that is currently in development, especially from what the director said about his take on the story in a new statement. Del Toro had this to say about finally getting his Pinocchio off of the ground. "No art form has influenced my life and my work more than animation and no single character in history has had as deep of a personal connection to me as Pinocchio. In our story, Pinocchio is an innocent soul with an uncaring father who gets lost in a world he cannot comprehend. He embarks on an extraordinary journey that leaves him with a deep understanding of his father and the real world. I've wanted to make this movie for as long as I can remember. After the incredible experience we have had on Trollhunters, I am grateful that the talented team at Netflix is giving me the opportunity of a lifetime to introduce audiences everywhere to my version of this strange puppet-turned-real-boy." Netflix is excited to help Guillermo del Toro bring his Pinocchio to life. News of the partnership comes after it was announced that Netflix is adding $2 billion to its debt, bringing the grand total to nearly $12 billion in an effort to get more original streaming programming made, along with other purposes. The streaming giant's vice president of kids and family, Melissa Cobb, released a statement talking about their excitement to work with del Toro again. The statement reads. "Throughout his distinguished career, Guillermo has exhibited mastery in inspiring people through his magical worlds filled with unforgettable and magnificent characters, from the monsters in Pan's Labyrinth to the aquatic beast in The Shape of Water. We are incredibly excited to expand our relationship with Guillermo and we know that his deeply touching vision for bringing Pinocchio to life on Netflix will be embraced by audiences the world over." With production starting so soon, Guillermo del Toro has already assembled a great team to help build his Pinocchio. 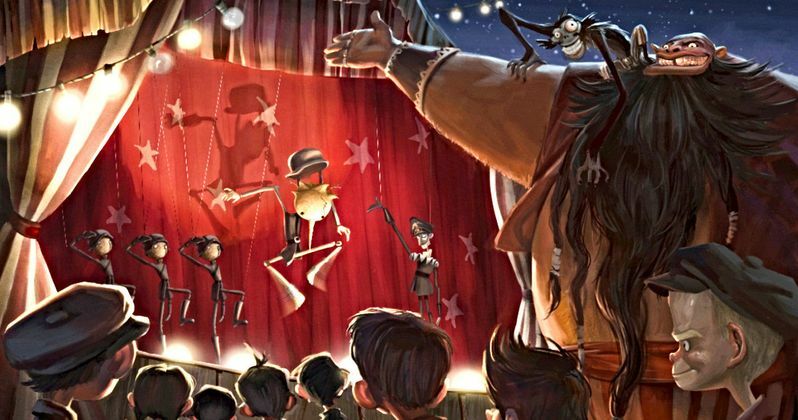 Patrick McHale is co-writing the script with del Toro, while Mark Gustafson, a stop-motion veteran who worked on Wes Anderson's Fantastic Mr. Fox, is on board to co-direct. The look of the character is based on Pinocchio designs by Gris Grimly, adapted by long-time del Toro collaborator Guy Davis. Mackinnon & Saunders, who worked on Tim Burton's Corpse Bride, will be handling the puppet making for the stop-motion musical with the Jim Henson Company and ShadowMachine taking on the stop-motion animation. Pinocchio is still going to take a while to premiere, but at least it's really happening now. With that being said, a release date has yet to be announced. The news was first announced by Netflix.